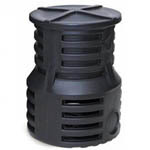 Atlantic Water Gardens Pump Vault Atlantic's heavy duty one piece design can accommodate a large pump up to 10,000 GPH. Vaults features large openings for pump access, cut lines for pump discharge and pipe extensions, and flat panels for custom plumbing applications. Atlantic's heavy duty one piece design can accommodate a large pump. Vault features large openings for pump access, cut lines for pump discharge and pipe extensions, and flat panels for custom plumbing applications.